Whereas software remains a mystery to me no matter how many drop down menus I access or how long I stare at code, I understand mechanical technology. It’s comprehensible – I can figure out how it works if I look at it long enough. I can fix it, make it do what it was intended for and maybe even something more. A free workshop at the Japanese Paper Place with a small letterpress and the artists from Graven Feather who skillfully demonstrated and assisted novices like me was the ultimate analog production experience. 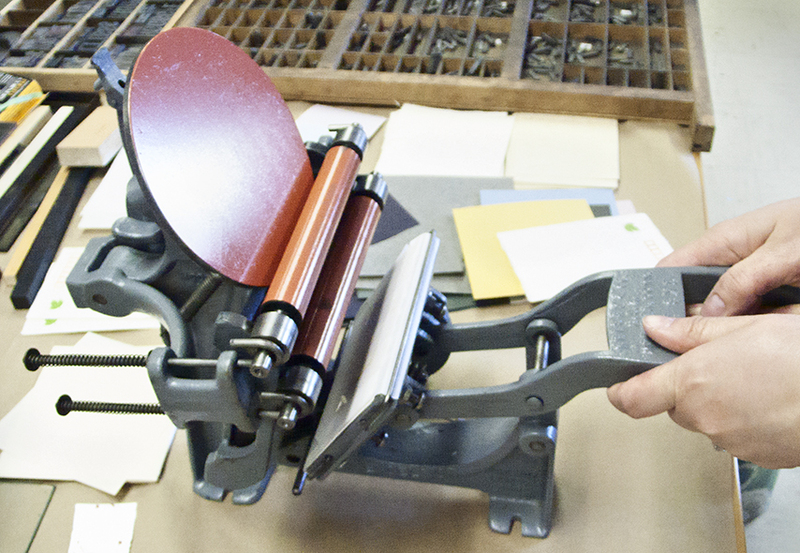 A letterpress is hand-operated, with several steps in its process. 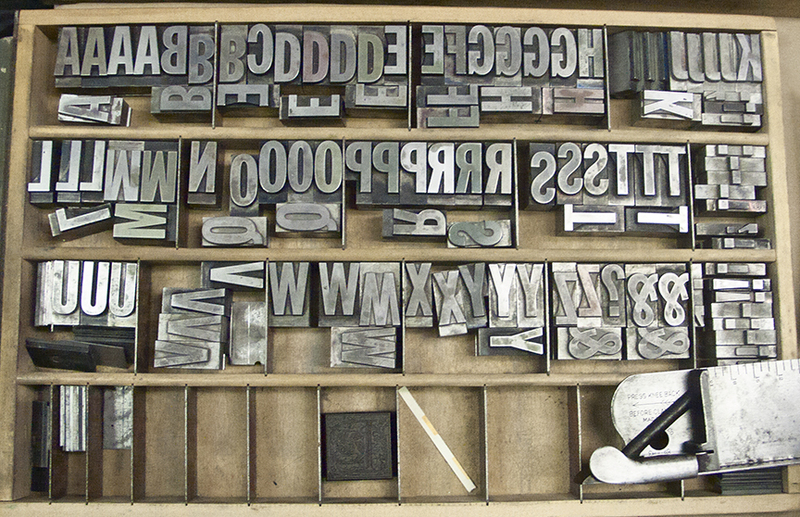 Choosing each heavy lead letter individually from the type case to spell out my message backwards. The texture and weight of handmade paper as I place it in the bed and align it with fingers and tape. The pressure needed to squeeze the tube of ink in my hand, its oily scent as it gets smeared around the plate, to be smoothed and picked up by the rollers and spread over the set type. I am making something out of real materials that exist even before I use them. I can’t explain why this one basically useless birthday card is any more meaningful than all the dollar store junk from China that fills our lives and landfills. Mass-produced machine-made goods, even useful and necessary things, can seem somehow boring in their perfect uniformity and encourage us to forget the human who conceived and operated the machine. With letterpress, inevitable irregularities in inking, leading and pressure, all result in variations that remind us that this item was individually handmade by a person using a simple machine. The beautiful object both generates a sensual pleasure and reminds us of an act of human work, and somehow it connects those two concepts.